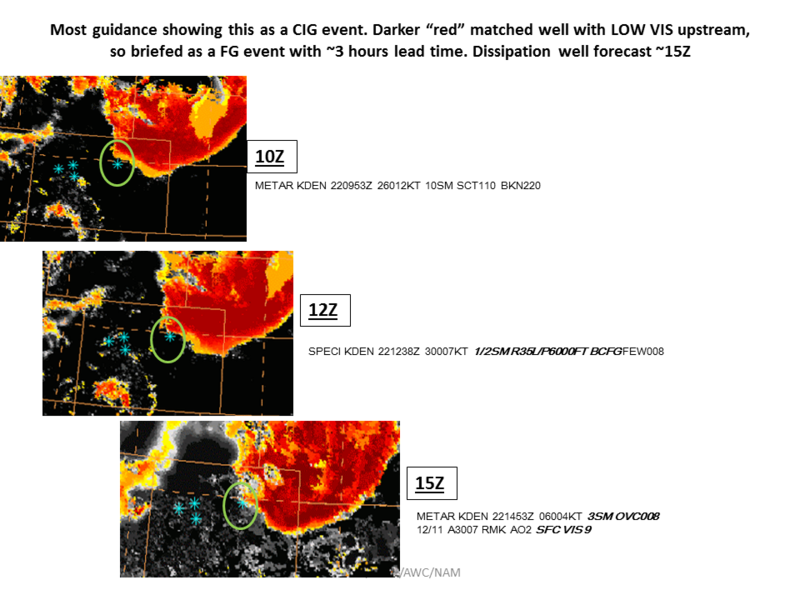 GOES-R IFR Probability Fields over Colorado and Nebraska on the morning of 31 August 2016 show high IFR Probabilities in close proximity to Denver International Airport (DIA), which airport was reporting IFR conditions starting at 1237 UTC. Webcams to the southwest and northeast of the airport shortly after 1500 UTC confirm that the IFR conditions’ edge was very near the airport. The hourly animation of GOES-R IFR Probability fields, below, shows the evolution of the field. Its motion could be used in a prognostic manner. GOES-R IFR Probability fields, ~hourly from 0400 through 1400 UTC on 31 August 2016 (Click to enlarge). 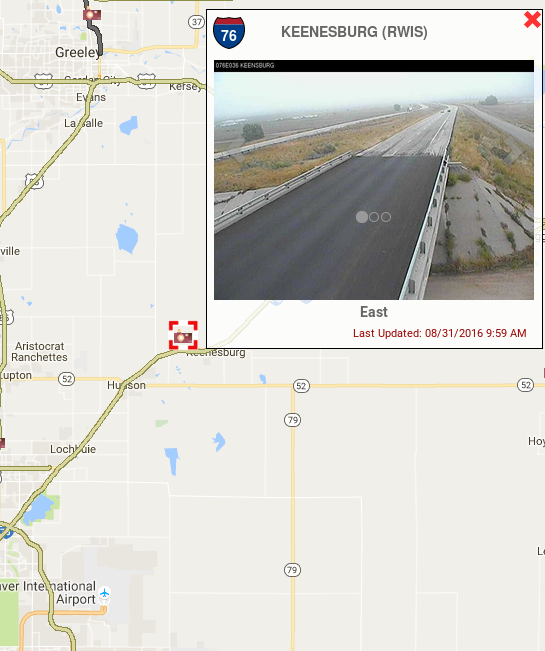 Surface observations of ceilings and visibility are also plotted. A similar event occurred on 22 September, see below from Mike Eckert and Amanda Terborg. This entry was posted in Aviation, Plains, Rocky Mountains on August 31, 2016 by Scott Lindstrom. GOES-R IFR Probability describes regions where IFR Conditions are likely. 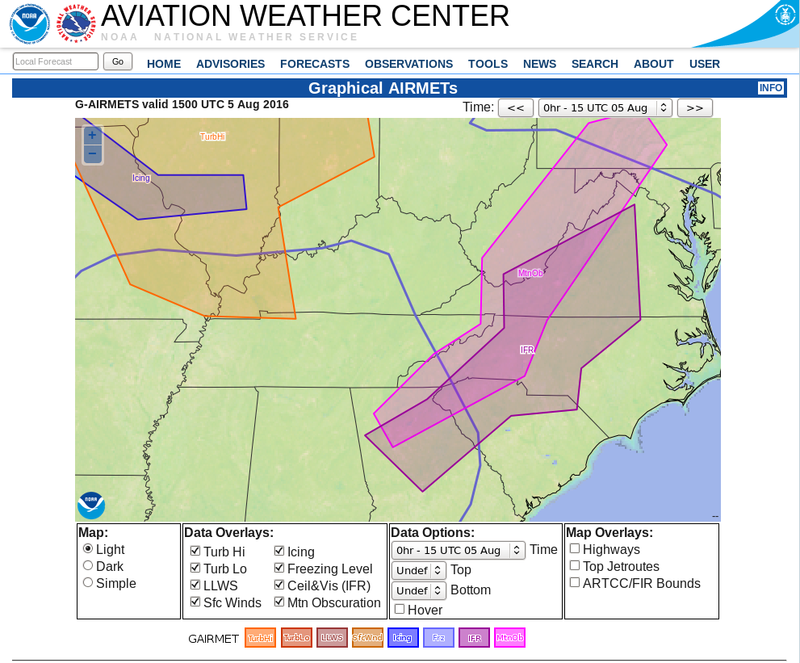 For example, the IFR Probability field above, from 1400 UTC on 5 August 2016, shows high probabilities over part of the Piedmont from Virginia southwestward into Georgia. Observations confirm that IFR Conditions (and near-IFR conditions) exist in this region of higher probabilities. 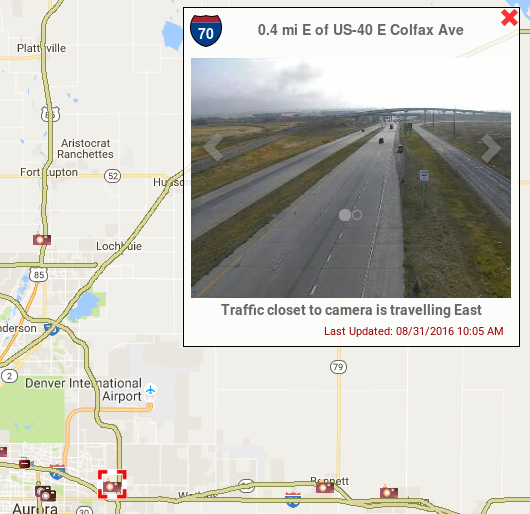 The Aviation Weather Center maintains a website with products that dovetail nicely with IFR Probability fields. 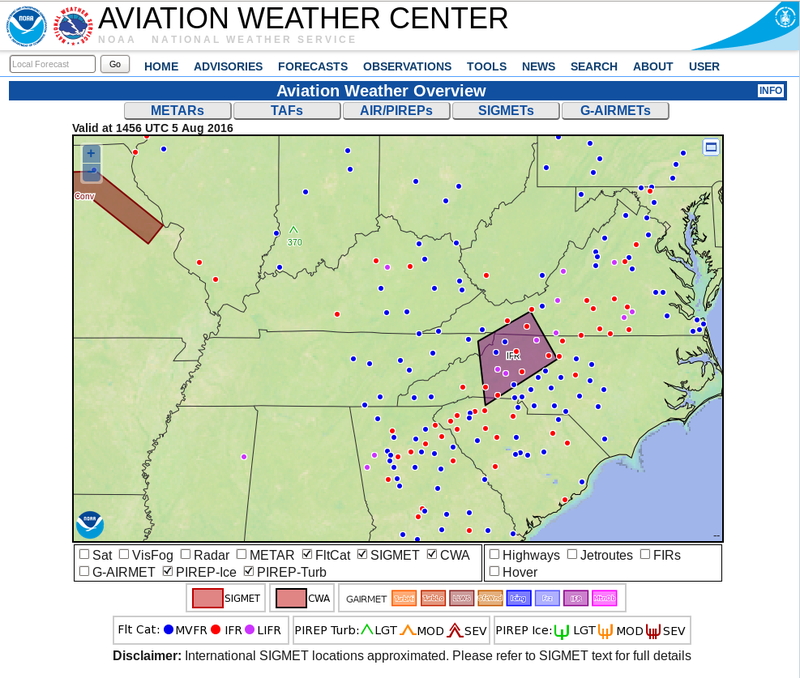 For example, the screenshot below shows stations reporting IFR Conditions (in red) and Low IFR Conditions (in magenta) ( a CWA-issued polygon on IFR conditions is included). 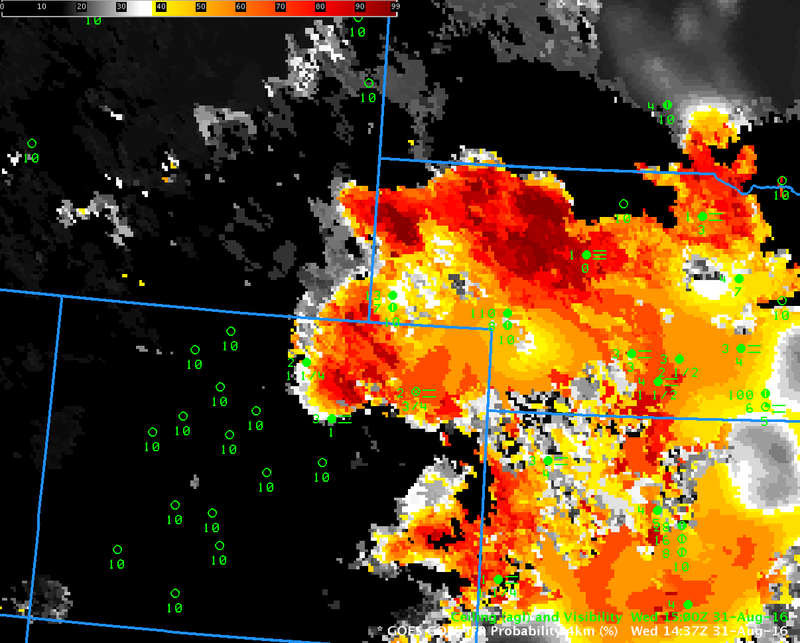 The overall extent of the IFR Conditions in the image above and plotted below is also roughly similar. The G-AIRMET of IFR Conditions, bottom, also shows overlap with the IFR Probability field, as expected. This entry was posted in Aviation, Southeast on August 5, 2016 by Scott Lindstrom.